For the first time, humans can hear wind from Mars. InSight, or NASA&apos;s Interior Exploration using Seismic Investigations, Geodesy and Heat Transport lander, provided the first "sounds" of Martian winds to human ears on Friday. The NASA InSight took this photo of the surface of Mars using its robotic arm-mounted, Instrument Deployment Camera after touching down on the surface of the planet, Nov. 26, 2018. The spacecraft&apos;s sensors captured a "haunting low rumble caused by vibrations from the wind," a NASA spokesperson wrote in a press release. The agency estimated the wind to be blowing northwest to southeast at 10 to 15 miles per hour, as recorded on Dec. 1. "The winds were consistent with the direction of dust devil streaks in the landing area, which were observed from orbit," the NASA statement added. The winds were consistent with the direction of dust devil streaks in the landing area, which were observed from orbit. InSight has been living on the Red Planet for 10 days. 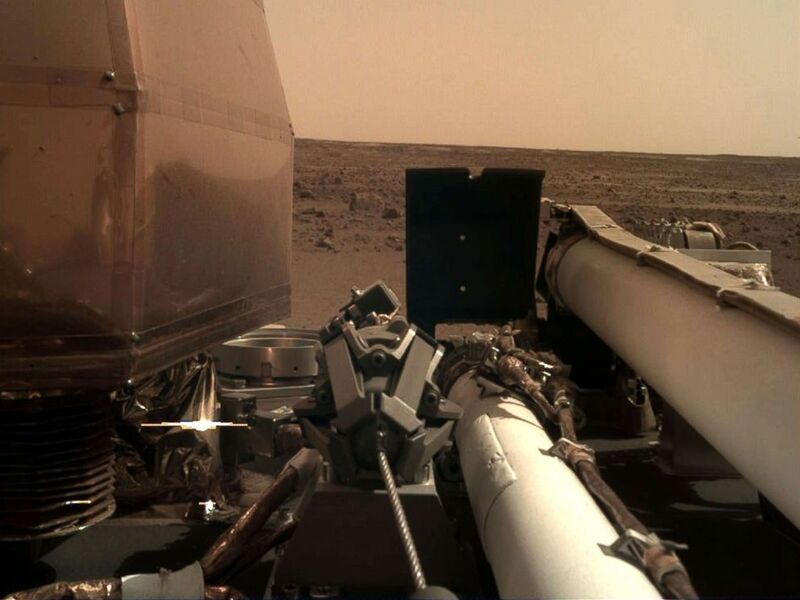 "Capturing this audio was an unplanned treat," said Bruce Banerdt, InSight principal investigator at NASA&apos;s Jet Propulsion Laboratory (JPL) in Pasadena, California. "But one of the things our mission is dedicated to is measuring motion on Mars, and naturally that includes motion caused by sound waves." The wind was detected by two sensitive sensors on InSight. An internal air pressure sensor whose job it is to collect meteorological data, recorded the air vibrations directly. An external seismometer which will be deployed by InSight’s robotic arm, took in the vibrations caused by wind blowing over InSight&apos;s solar panels. In a few weeks, InSight&apos;s arm will set the measuring device on the surface of Mars. Until then it will track data from vibrations for scientists to detect "marsquakes." The seismometers are French, and provided by the French Space Agency CNES, and include components developed at Britain&apos;s Imperial College London and Oxford University. “The InSight lander acts like a giant ear,” said Tom Pike, InSight science team member and the sensor designer at Imperial College London. "The solar panels on the lander&apos;s sides respond to pressure fluctuations of the wind. It&apos;s like InSight is cupping its ears and hearing the Mars wind beating on it. When we looked at the direction of the lander vibrations coming from the solar panels, it matches the expected wind direction at our landing site." Published on Sat, 08 Dec 2018 16:01:00 GMT, © All rights reserved by the publisher.